A malfunction with your experimental R-COIL engine has torn a hole in reality and you have fallen through it. You find yourself under attack by a horde of unfamiliar and hostile creatures. Your main thruster and weapons systems have been fused and your stabilizer is offline; you cannot fire your weapons without moving. Will you find your way home, or will you die trying? 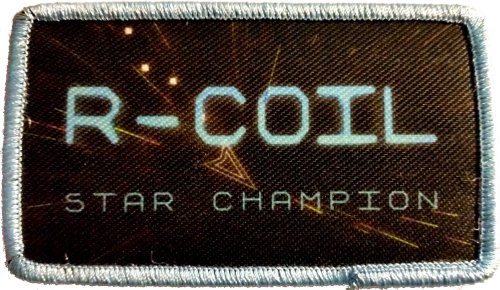 R-COIL IS NOT A TWIN-STICK SHOOTER! Get a High Score & Earn a Patch! It would be odd to make a retro vector space game without old-school bleepy bloopy sounds and music to go with it. That's why we got in touch with weirdo extraordinaire Rainbow Kitten to make the sound effects and music for R-COIL. You can’t tune a piano but you can tuna chip... or something.